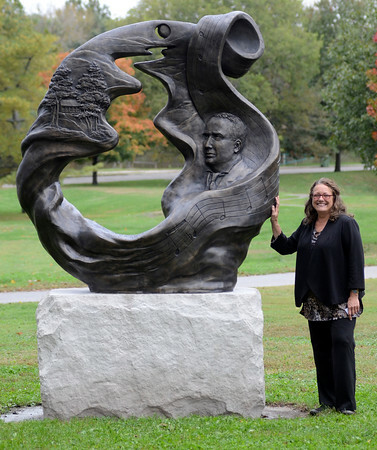 Tribune-Star/Jim Avelis Her song: Sculptor Teresa Clark stands by her bronze work "A Song For Indiana" that was dedicated Wednesday evening. The sculpture features a relief of Terre Haute native Paul Dresser along with lines of music and some words from his song. Words in ""On the Banks of the Wabash (Far Away)" the Indiana state song, are also reflected in some of the artwork worked into the piece.